The UW’s CSE department is one of the best in the nation. Everybody wants to learn how to code — well, at least it certainly seems that way. The latest “intended major” statistics from the incoming freshmen class at the University of Washington show more than 700 high school seniors planning on majoring in computer science — a number that has seen exponential growth in the last few years. 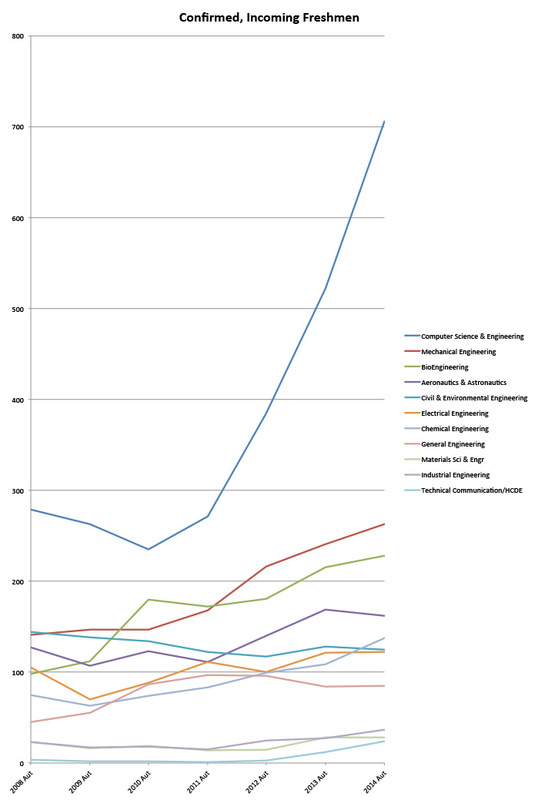 Here’s a look at the intended engineering-related majors of incoming freshmen at the UW since fall of 2008. You’ll notice that in 2010, 235 first-year students said they wanted to major in CSE. That number jumped to 271 in 2011, and then skyrocketed to almost 400 in 2012. Graph courtesy of the UW computer science department. Ed Lazowska, the Bill & Melinda Gates Chair in Computer Science & Engineering at the UW, said that these numbers don’t tell the whole story. The UW also takes a couple thousand transfer students each year, a number of whom also intend on majoring in CSE. On top of that, the CSE program has an introductory course — unlike most other engineering majors at the UW — and many others decide to major in CSE afterward. “The data on the graph really understates things,” Lazowska told GeekWire. We’ve reached out to the UW for data on other “intended majors,” but it’s already clear that college students are seeing the benefits of a computer science degree more than ever. This pattern is not just happening at the UW, but at universities around the nation. But though the UW’s nationally-recognized computer science program has pumped out its share of successful graduates, there exists a simple problem: It’s turning away hundreds and hundreds of qualified CSE students who are forced to pick another major or transfer. There are currently about 250 CSE graduates per year, with demand more than triple that. There are early plans to build a new facility across from the six-story Paul G. Allen Center, which opened in 2003 and houses the CSE department. But nothing has been set in stone yet, and meanwhile, demand for tech-related jobs in Washington continues to grow. As my colleague John Cook outlined two-and-a-half years ago, perhaps it is time to launch a world-class private technology university in Seattle.